We did the Rome by Night Segway Tour. It took us 3 hours. Our guide Dimitri was great. He told us a lot about the sights and buildings and is a funny and relaxed person. The first few minutes we needed to get used to the Segway. After it was just pure fun and we could focus on the beauty around us. 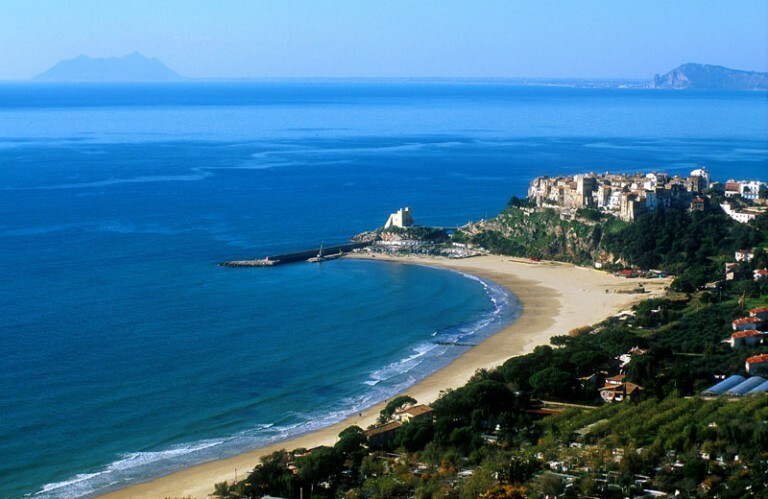 It is absolutely recommendable and a nice change to walking, especially after a exhausting day in the city. I booked this activity as a surprise for my partners 30th birthday. We were both nervous as we had no experience on segways but the tour guides were very patient with us during our training. The tour was brilliant! Very informative & a great way to get around a busy city. Our tour guides, Alessandro & Stefano answered all our questions & showed us some great places to eat – The Lost Food Factory. This company is a well run and professional company. We were all first timers on a segway and our guide Bruno had us feeling happy and confident quickly. He then gave us such a fun and interesting tour of Rome, we saw and learned much and smiled and giggled the whole time. Thank you Bruno for an excellent time! The lovely lady who guided our tour, Julia was very patient and kind especially because I was very apprehensive and nervous to get on the segway. She guided us around the highlights of Rome, including Circus Maximus, Piazza Navona, The Colosseum, Pantheon and showed us around a local market. She gave us tips for the rest of our trip including restaurants and other markets which we checked out. The Segway tour is good if you wish to do sight seeing in a short period of time. We chose to do this tour as a bit of fun on our trip to Rome. It ended up being one of our most favourite tours! Dimitri our guide was awesome and very informative on all our historical stops. Very much recommend this tour. We did the 3.5 hour tour and wish we chose the longer one! 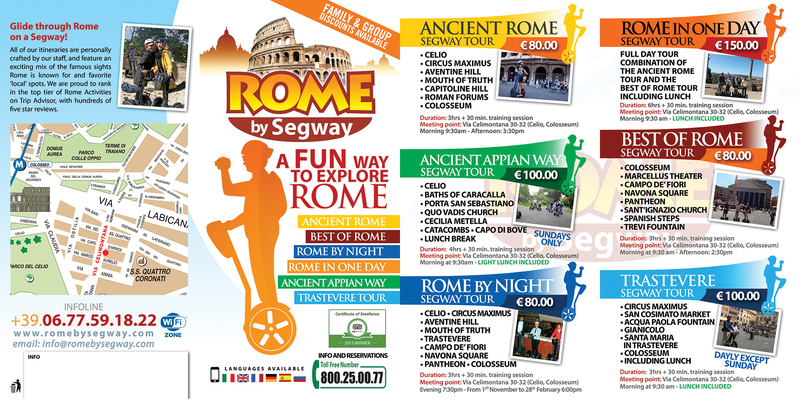 Had a fabulous fun time with Alessandro viewing ancient Rome by Segway. Learned such a lot with plenty of time everywhere. Training was excellent and the segways were a brilliant way to get around the gorgeous city and all its monuments. Our group of eight had such a good time we booked for the night tour with the wonderful Eddy who continued our education and entertainment brilliantly. Meraviglioso tour della Roma antica…mi permetto di consigliarlo a tutti.Chiedete dell’archeologo Eddy,una simpatica fonte di sapere che vi aiuterà a conoscere le meraviglie dell’antica Roma, svelandone tutti gli arcani segreti. My fiancé and I decided last minute to do a Segway tour on our trip to Rome. I’m so glad we did! Our guide, Dimitri, was wonderful! He gave everyone a mini lesson on how to operate the Segway, which I found easy after about 10 minutes of practice. The tour was a little off the beaten path- churches we would have never noticed,and views from the top of the Roman Forum, which could be managed by foot, but given the choice I would have never walked it. That’s just a few of our stops. He even let us stop at a place to use the restroom and grab and cappuccino or glass of wine, which had a rooftop panoramic view of the city!! Be warned- after learning the Segway you won’t want to walk any more! We enjoyed every minute! This was the highlight of our visit to Rome. We booked at 3 hour tour – our guide Julia was excellent! She was very knowledgeable and interesting to listen to. We had never been on a segway before and got the hang of it straight away. Great fun and a great way to see the sights. Would recommend this to anyone!